When I was a kid I preferred to only eat raw carrots as opposed to cooked ones. It took until I started cooking on my own and experimenting with recipes to realize that my dislike of cooked carrots came from eating them once they were overcooked and mushy. I don’t like mushy foods when I know they’re supposed to have another texture. This probably explains why I’m not a big fan of beans or peas. However, I like applesauce which is essentially overly cooked mushy apples, but there’s always an exception to a rule right? 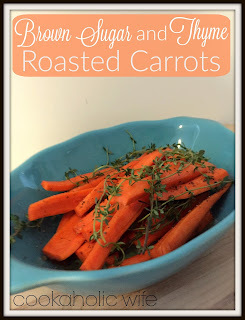 Thyme is a really common herb to add to carrots so I figured that was a good of place as any to start. Now carrots are more on the sweet side naturally and roasting only intensifies that flavor, but I thought a little bit of brown sugar to add to that caramelized sugar flavor surely couldn’t hurt. And it’s such a small amount, you could still call this a healthy recipe! 2. 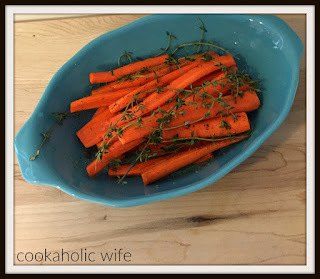 Toss the carrots with the olive oil to coat. Arrange in a single layer on a baking sheet. Sprinkle the brown sugar, salt and pepper evenly over the carrots. Arrange the fresh thyme sprigs on top. 3. Roast for 30-35 minutes, flipping over once, until fork tender. How easy is that? If you already have chicken, turkey or even beef going in the oven this can snuggle on in as well and requires next to no work at all to prepare.